Magic happens when the Chiefs hit the road. They bring the sounds that unite Seminole fans everywhere, from the unrelenting war chant to the deeply moving “Hymn to the Garnet and the Gold.” They inspire our great athletic teams to “strive for victory,” and they create a bond among generations of band members that is cherished forever. 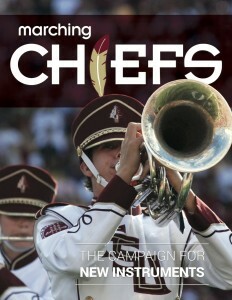 Our goal is to spread the Seminole spirit by sending the Chiefs to additional away games. The Marching Chiefs have been excellent stewards of their financial resources, but additional support is needed if we are to expand our reach. Please consider making a contribution, large or small, to get the Chiefs on the road to additional games, to inspire more fans, and to stand strong with the team. Go ‘Noles! Go Chiefs! Initiated in 2013, the New Instrument Fund has already provided numerous top-quality instruments for our Marching Chiefs. But keeping the inventory in top condition will always be a priority. Our students deserve equipment that will allow them to sound their very best. Your tax-deductible gift to the instrument campaign will be used to ensure that we keep the sound of the war chant ringing strong throughout Doak Campbell Stadium well into the future.